The most recent "System Reserved" partition, the result of the full backup with the incremental backup applied. The most recent C: partition, the result of the full backup with the incremental backup applied. The original "System Reserved" partition full backup. The original C: partition full backup. If you have multiple incremental backups that have accumulated since the original system image was created (a common situation), you'll see them all listed. In general, you want the most recent backup of the partition that contained the file that you're attempting to restore. I've selected the most recent C: partition. 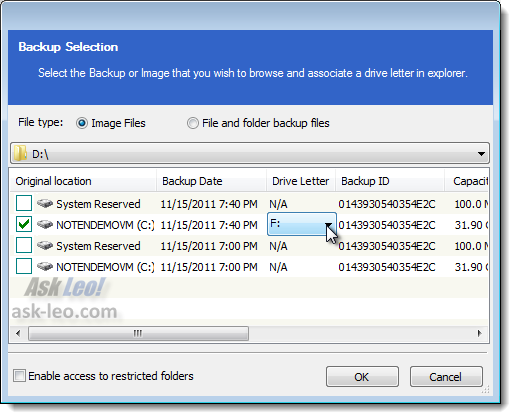 You also need to select what drive letter will be used to access the contents of this backup. I've selected F:. Macrium now mounts that backup as drive F:. What that means is that you can now browse the contents of the backup image using Windows Explorer - or any Windows program. Once you locate a file that you want to recover, you simply copy it from the mounted backup image to your local drive as you would copy any other file between drives. It'll ask you to select the drive on which a backup image is mounted on; pressing OK removes the mount and the drive letter from use. That's really all there is to it. 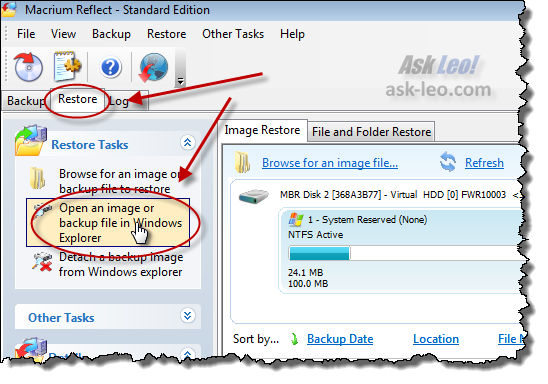 The ability to mount a backup image and browse it with tools that you're already familiar with (such as Windows Explorer) make looking for restoring files contained within an image backup a snap. Restoring an individual file from an image backup using Macrium Reflect. Even though you have an image backup, that doesn't necessarily mean you need to restore the entire image. It's quite possible to use that image to get at individual files. I'll show you how. We'll click on Restore in Macrium Reflect and what we will do is 'Open an image or backup file in Windows Explorer.' We are presented with a list of the backup images that Macrium knows about. Select the most recent one from the drive that contains the file you want to restore. Select a drive letter. You'll see a list of unused drive letters on your machine. I'm just going to go ahead and use the first one, F. What happens is Macrium mounts that backup image into a virtual disk drive that you can now explore and you'll find various files that were in your backup as of the time that you took your backup. Using Windows Explorer, you can locate the file that you want to restore and then copy it back to your hard drive. I'll just grab this copy of lastpass.exe that I have lying around. We'll copy it from the backup. I'll switch over to my C: drive and I'll go ahead and paste it here into this folder. That file has now been effectively restored from the backup image. 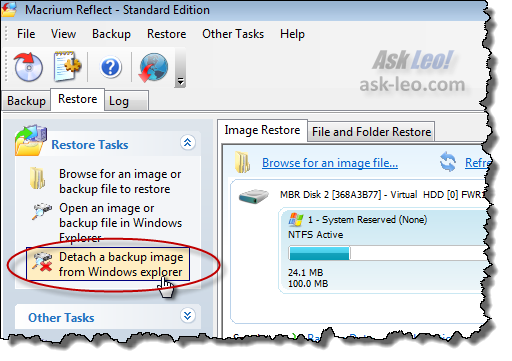 Once you're done restoring whatever files you want from the backup image, you would then go ahead and detach that backup image from Windows Explorer. The only one we have attached is F, so we'll detach it. That's all there is to it. Browsing backup images using Macrium Reflect is very easy and a very safe way to go back and get files from your backup images. Can Images/Backups be encrypted under Macrium? Yay! That ties it! I'm getting Macrium, assuming it isn't too expensive, just as soon as I get home from my vacation! That's a plus on BootItNG, which offers no encryption on its backups at all. BootItNG has served me well, but it's really a disk-and-partition manager (as well as a backup program) and is really far more complex a program than I need; it actually makes me very nervous every time I access it, for fear I'll commit some hideous mistake or make some terrible accidental keypress, or otherwise access some option I shouldn't. It's really a "power-user's" program, and although I'm an extremely competent and advanced user, I'm definitely not quite as far as a "power-user". Tell us: Do they give any clue what the encryption algorithm might be? Or is that "proprietary"? Ah, the ever-ubiquitous AES. (Sigh.) No imagination -- no Twofish (or even Blowfish), no Serpent, no Skipjack, and no RC4... just plain ol' AES. Sheesh! Doesn't anyone know anything else, these days? Can't really complain, though: it's a good, solid cipher, military-strength and NIS-approved. And -- praise God! -- it's a real cipher, not snake-oil! That's the really important thing. Thanks for the info, Leo, it's appreciated. I tried a backup before and got totally confused very quickly. I just read through your series here and got totally confused very quickly. I hope some day there will be an easy way to do a backup because I really want to do it -- your many admonitions to do so strike a note with me. But there must be an easy way to do it some day I hope. If at first you don't succeed, try, try again. It's definitely worth it in the case of backup. The user interface looks a lot better than Acronis, the previous backup utility you recommended. If you have changed your preference, I agree. Recent versions I found difficult to recover single files. The latest version of Acronis has a new UI and I findi it absolutely awful. It seems to have been designed for use via a touch screen, listing files for selection but only four per screen!!! Also, you have to create another recovery CD for every new release. Older version CDs will not open backup files created with newer versions. But the help info doesn't warn about this. I have VirtualBox running Windows XP on a W7 machine. Will Macrium back-up the entire shebang? Or do I need it on both "machines". It depends on how you want to organize things, but Macrium will do either. (Coincidentally it's doing both at times for me.) Backing up the host machine and everything on it backs up the virtual box images. You can then restore those images if you like since all they are are files. You could run Macrium inside the virtual machine and back that up separately if you like. Remember a virtual PC is just like having another physical PC. I'm putting a new hard drive into my system running (Windows7 Ultimate 32bit & 4M of ram) and I've been advised that when I re-install off my master disk to use the 64bit. I've taken 3!! backups of my hard drive and am a little confused about getting all (most) of my programs back off my external J: drive if I've just installed a new 64bit version and everything is saved in 32bit in my 'backup'. Will I need to download Macrium onto my C: drive to get at the 'restore' option? Am I going to encounter problems with compatibility? Sorry if I appera 'nuggett-like' but we've all got to learn! Somebody, somewhere must know the answer to this. I use Windows live mail in W7. When I browse my backup I can't find it. Could it be a hidden file? If so, how do I unhide it? Backing up, following your instructions is easy - using the b/up - not so easy. You don't mention 'Back-up Verification' concerning Macrium. I would think verifying the back-up image should be a must do? It's a "good to do", but I don't consider it an absolute necessity unless you know you're backing up over a flakey connection or to a flakey drive (in which case I'd rather see you switch to something more reliable). It certainly doesn't hurt, other than taking more time. Not sure what I did wrong but I've just recovered from a major crash and I just couldn't seem to make Macrium Reflect work for me. The computer in its crashed state couldn't see the Rescue Media disk so I finally gave up and had a technician reinstall Windows. Next the now "new" computer no longer has Macrium Reflect on it so therefore can't read the External Hard Drive containing my backups. Thankfully I had an online backup as well on MyPC Backup and I've finally recovered all my files from there. Think I'll still be friends with Leo but for some of us the big difference between file backup or storage, and computer backup remains a mystery.